Environmental right groups and civil society organizations across Burma gathered on a ship on the Irrawaddy River in Mandalay demanding an end to mega-dam projects to mark this years International Day of Action for Rivers, on March 14. The Burma Rivers Network, Save the Salween Network and civil society groups who want to stop the damming of Burma’s rivers and the destruction of the environment came together to celebrate the country’s vast free-flowing rivers and to declare that no large dams must be built on these vital waterways. A joint statement released by the groups said explained their opposition to government plans to strangle the rivers with dams. The Alliance’s statement accused the government of ignore the rights of ethnic communities to govern their own resources and to maintain their cultural identities. The groups pointed out that the current government’s support for the construction of large hydropower dams in areas of ongoing civil war is leading to an intensification of armed conflict, human rights violations, especially including women and children, and directly contradicts the principles of federal democracy. Naw Yu Yu, Relationship Coordinator of the Karen Student Network Group (KSNG) who took part at the protest said that it is important everyone make a common demand for their voice to be heard. Speaking to Karen News, Naw Yu Yu said. In their statement, the group called on the Burma Government to impose a moratorium on the existing construction of large hydro dams, to abandon all planned and proposed large dams, and demand that investors respect the rights of the people of Burma, as they try to lead efforts to build lasting peace and a genuine democratic federal union. 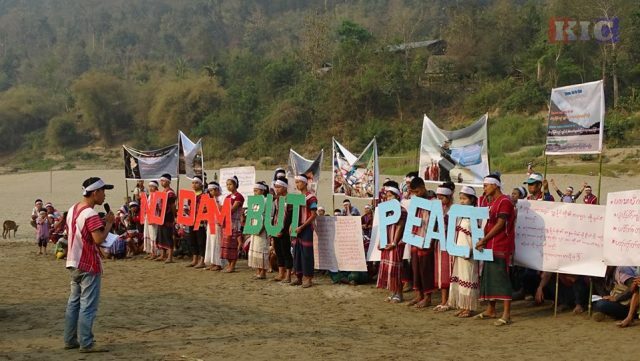 Meanwhile, Karen community based organizations including the Karen Rivers Watch (KRW) together with local communities gathered on the banks of the Salween to demand that all proposals for the construction of large dams on their rivers are completely abandoned. The Karen Rivers Watch Statement said that the government’s proposed Hatgyi dam on the Salween River threatens to flood and starve ancestral territories, permanently displace villagers from their heritage, and inflame conflict and insecurity. KRW pointed out that the armed conflict that broke out in September 2016 in the Mae Tha Wor area of Hlaingbwe Township in Pa an district caused displacement of more than 5,000 people from 28 villages and is linked to the proposed Hatgyi dam. KRW called for ethnic governance and natural resource management systems to be recognised at all levels of decision-making and administration by Burma’s government. The group urged the Burma Government and all investors to abandon their support for the Hatgyi dam, and all other large dams in Burma, so that those most affected by civil-war can lead efforts to build lasting peace and a genuine democratic federal union.